BETH KANELL: It’s funny the things that lead into writing a mystery. For THE LONG SHADOW, the most important turned out to be a newspaper ad: an old house for sale about 20 miles from here, with an “Underground Railroad hiding place” in the basement. Add $40,000 to the asking price for that! 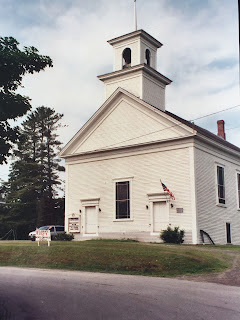 But I had a strong suspicion, soon confirmed, that in northeastern Vermont, any hiding places in old houses probably connected to generations of hidden boozing – and that African American in Vermont in the 1800s could live freely. That turned out to be supported by research. But people around me who had caught the Underground Railroad romantic myth refused to give it up. What a puzzle! As a mystery writer, my reaction was: I’ll paint the story in vivid detail and suspense, so you can see that the facts of what happened can be at least as exciting! That’s how Alice Sanborn came to life in the small but thriving village of North Upton -- fifteen years old, happy, embracing her best friend Jerushah and their beloved “younger sister” friend Sarah, in 1850 in rural Vermont. I love to write this age, because you’re confident in your views then, but there is so much happening under the surface of life that you’re about to notice with newly adult eyes. Romance, of course. But for Alice, also the intense conflict of Abolition. It’s not as simple as waving a magic wand and saying “You all are free now.” And her family is knee deep, maybe hip deep, in the complications. Three deaths take place in THE LONG SHADOW. For a “young adult” tale that’s not set in wartime, that’s actually a lot. The most personal of them will haunt Alice all her life and shape most of her choices. But first, of course, Alice needs to investigate her situation: spying on her own father and brother, discovering resources like the former slave Miss Farrow in a nearby larger town, and testing whether the handsome but mysterious Solomon McBride can be trusted with the lives of her closest friends. The images here are vital to the story. 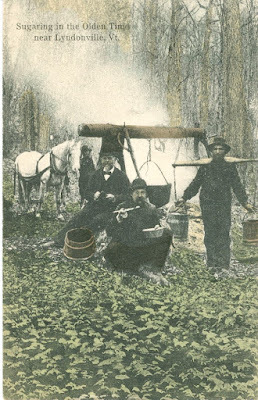 First is a view of maple sugaring – the boiling of maple sap into syrup, and then further boiling the syrup to make “cakes” of maple sugar. The real-life village of North Danville (model for North Upton), part of Danville, Vermont, sold thousand of cakes of maple sugar in the 1800s, as people who recognized the role of enslaved people in producing cane sugar in the Caribbean protested via their grocery shopping and kitchens, using locally made maple sugar instead. Then there are two current photos from the village: the (still standing!) inn where Jerushah and her family live (across the road from Alice’s family farm), and the village church where Alice realizes how tough and determined her mother can be. 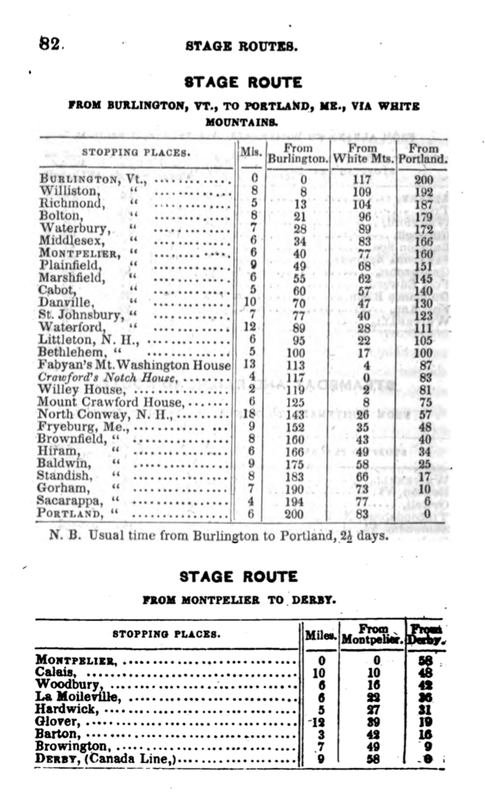 Then you can see the actual horse-drawn “stage” schedule from 1848. The cemetery stone belongs to the “real” Ruth Farrow, who had lived enslaved in Rhode Island, but free in St. Johnsbury, Vermont. 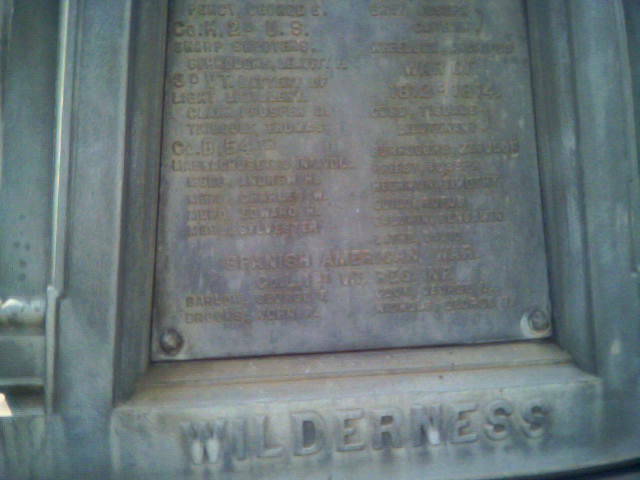 And last is a village green marker in Coventry, Vermont, naming the four Mero brothers – “free Blacks” who enlisted to fight for the Union (the stone mentions the Battle of the Wilderness). Those last two markers illustrate what my husband calls the Law of Unintended Consequences: I wanted to show how Abolition looked in Vermont, and ended up also finding a different view of Black Vermonters than today’s “white-bread” images of the state’s history usually portray. Alice’s teen-turning-adult adventures and narrow escapes depend on her own discovery of who’s taking action, and how much she is willing to risk to do her part. THE LONG SHADOW comes out in hardcover and ebook on April 18, from Five Star/Cengage. Let me know what you think, as you discover the people and reasons behind the crimes involved. Like Alice, your view matters! BIO: Beth Kanell lives in northeastern Vermont, with a mountain at her back and a river at her feet. She writes reviews mysteries, poems, hikes the back roads and mountains, and digs into Vermont history to frame her “history-hinged” adventure mysteries. Look for her earlier books The Darkness Under the Water, The Secret Room, and Cold Midnight. She shares her research and writing process at BethKanell.blogspot.com; her mystery reviews are at KingdomBks.blogspot.com. She’s a member of both Sisters in Crime and the National Book Critics Circle, and can’t resist reading more mysteries! Congratulations on the new book, Beth. “The Long Shadow” sounds intriguing and I am looking forward to meeting Alice and reading your story . . . . Thanks, Joan! It's great to finally have the book "shareable" as it comes to publication next week. I read and blurbed this book. It's beautifully written with great storytelling, and is truly for readers of any age. Thanks, Beth, for sharing more of the background, which I didn't know. But you didn't mention that Alice and her family are Quakers - so it's Quaker week at Jungle Reds! We love it when unexpected connections happen on JRW! I would love to have Alice and her family be Quakers -- but my personal experience is from one step away (my mom's mother, my brother) and I didn't dare write the Quaker experience that you are SO good at, Edith! Still, it's important that Alice on her wild race northward meets a Quaker in the little town of Glover; hold onto the moment, because of course, as a budding Abolition activist, Alice will be meeting many more Quakers in Book Two. You gave the book such a lovely blurb, Edith, and I am touched to have this deeper connection. Lucy, it's such a small world among women who write crime fiction, isn't it? We have wonderful cross connections and surprises! Huh. Why did I think they were Quakers?! Interesting. Wow, this one sounds great. I am always looking for crime-related YA books that I can promote on the blog, so this one is going on the list. Kristopher, that would be awesome -- I still have two review copies left, so email me if you'd like one this week. (Anyone else with a blog want the other one?) Reach me at BethPoet at gmail dot com. Beth, congratulations! That sounds fascinating. The stage schedule is so amazing… Where did you find all of that cool background, and how do you put it all together? ( I know… That’s the tough question)! And how does the fact that you are writing a young adult novel change how do you make decisions? Hank, like you, I need teammates to help with the research, and my husband Dave is constantly combing archives and finding images that help. But the stage schedule is one I found on my own, in a tourist guide from 1848! 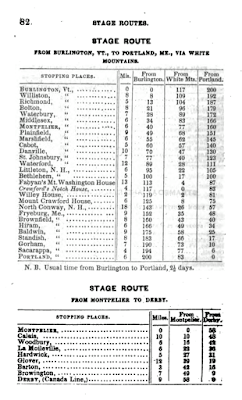 Northern New England was a wild adventurous frontier at the time. Young adult: Yes, absolutely, it changes how I write about violence and how it affects the young women experiencing it. I also try to be more "hopeful" because all of life is in front of my characters ... although Alice's hopes are rather mixed by the end of this book! Thank you so much for asking and for the congrats -- what a wonderful adventure. And much love to Dave! Beth, so interesting how romantic myths persist despite evidence. I know that! I have friends who sugar in the town next to mine. Maple syrup has become such a high-demand product, it makes more financial sense to make the syrup, which is comparatively easy, rather than the sugar, which takes longer and requires even more oversight, since the closer it gets to crystallization, the easier it is to burn. They do make a small batch of candies and sugar near the end of the run, and save them as presents for friends and family! Hallie, I bet you have run across myths you long to "debunk" too -- and of course your books constantly confront the one about women being "softer" than men or than their circumstances. I loved this! I think the book sounds quite intriguing and the pictures really capture the imagination. I'll be looking for the book and congratulations, Beth! Thanks, Kay, I'm glad this tickles your imagination and curiosity. I'll be watching for your thoughts on the book next week! Beth, I'm always on the look-out for something good to read--and quite often peruse the YA 'new fiction' shelves at my local libraries--because a good story is ageless--and your books sound so much more interesting than another urban fantasy/romance with werewolves and vampires! Oh Flora, isn't YA fun to read as an adult?! Of course in 1850, there are actual wolves around, so no need for werewolves ... in fact, in my region today, we all sort of want to have wolves visit (not stay!) and are always looking for their tracks up on the ridge -- although with a shiver of fear, too. Thanks for the warm welcome, Coralee. Yes, working out the horse details was a constant side "melody" of The Long Shadow. The stage schedule played an enormous role in each location's community life and interdependence. And then, when Alice and her friends need to drive the horses north in a snowstorm ... well, I won't spoil the plot, but I had a long consultation with a local horse expert who still pulls wagons and such with his horses, working out their pace in the storm, and uphill, and ... So much less easy to make a get-away when the harnesses and the needs of the horses must be considered! 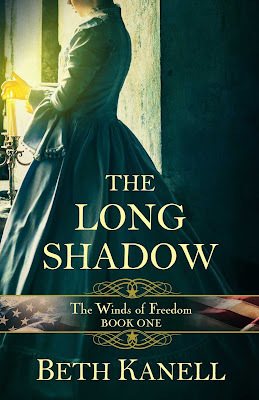 Beth, THE LONG SHADOW sounds fascinating - I suspect my history-loving teen will dive right in. The antebellum period in the northeast is such an extraordinary time, with staid New England, land of small farmers, lawyers and Congregational ministers, exploding into radical politics, liberation theology and culture-shifting philosophy. Vermont often gets left out of the discussion of those times since Massachusetts gets all the attention. I was fascinated to learn, on a visit to St. Albans, that a raid on the town was the northernmost point of conflict during the Civil War. I remember thinking it would be great in a story - I hope it's on your radar for the future! Julia, you are so right -- the antebellum period is complicated and wild, in terms of what people proposed to "right the wrongs" of slaveholding and how much they were willing to give up to have justice prevail. While you're shaking your fist at Massachusetts (I get it! ), do you ever think about the years when Maine was actually part of that colony? In the research for these books, I have to cross-check often, as people who live in "Massachusetts" turn out to have been buried in Maine, without changing location! Yes, St. Albans has quite a story -- it's also Vermont's most potent area for Abenaki activism (see The Darkness Under the Water, which I hope your history-loving teen will also run across). Where there's injustice, there will be violence; doesn't that fit the experience in your books, too? Welcome, Beth! Congratulations on the new book, which sounds like a wonderful step back in time. I love that you are shining a light on a part of Vermont's past that will be news to many people. I'm always appreciative when an author teaches me something new, without being preachy. Can you tell us what you're working on now (in addition to promotion, of course!). Ingrid, thanks for the welcome! Vermont is indeed in the news often as a "radical" or "progressive" place, but also portrayed as historically entirely White -- which erases the history of the many African Americans, Native Americans, and Latinex people who've made their homes here. It's exciting to combine research and the mystery itch, in painting a vibrant picture of that step back in time. Latest work: I'm building a book of poems around this past winter's real-life scary adventure in women's breast cancer (wow! ), just wrapped up a book of 12-step recovery stories, and am constantly working on Book Two in the Winds of Freedom series ... today I'm figuring out how a sneaky land speculator can strip the value from a timber parcel, while maybe also being a "good guy" in the sense of helping the push to end slave-holding. In the past month, I've tracked down the slave-owning pasts of many founding families from this part of Vermont -- an ugly side of the deeper past that again tends to be buried and forgotten. I love this work! Thanks for asking about it! The things you're working on sound intriguing and varied! A wonderful combination! I'm glad you like the sound of it! Peggy, that will be lovely -- and write to me, if you like. I enjoy sharing the images particularly! Real life more interesting than a romantic myth? I've found that is often the case. Great job weaving that into fiction. Thanks, Mark! As you can imagine, the churches kept particularly detailed records at times, which is a huge help. Discovering the reasons people might be expelled from a congregation, for instance, opens up new aspects of daily life and what was considered a serious breach of the responsibilities to God and to community. Hope you'll have a chance to read the book! Laughing about the hidden boozing! My husband had a relative in Louisiana who threw all his empties under the house. Must have been hundreds of bottles under there. We lived in a village in the Western Reserve of Ohio that was on the underground railroad. It was an open secret that houses with hiding spots were marked by black trim around the painted white chimneys. Your Vermont story sounds amazing, Beth! Pat, what a pair of wonderful family stories! Mystery readers in particular, who are attuned to realizing when a book is "hinting" at what's ahead, will realize Alice Sanborn may need to visit the Western Reserve herself in the next book -- if I get stuck, I'll check in with you on details. In terms of boozing, it's a little-known and startling fact that Vermont as a state went "dry" in 1850 and did not allow liquor again until 1902 ... followed, of course, not long afterward, by nationally legislated Prohibition. Vermonters became smugglers as early as the Revolutionary War, found more call for it during the War of 1812 as a border state wanting to continue some trade with Canada, and then had three generations of hiding the booze! Congratulations, Beth! This book sounds fascinating. As a New Englander (CT), there is so much here I didn't know and I spent a lot of time vacationing in VT. I love that the idea came from a real estate ad. Inspiration comes from the strangest places. Totally, Jenn! Of course, CT has many more Underground Railroad adventures that are life-and-death in their outcomes ... Some of the research I'm doing for this series leads to CT because so many strong voices rose up there. Hope you enjoy the book!